Venerable Dekyi’s wish is to share the beauty, depth and practical compassion of the Buddha Dharma with all who have an interest. She is warm and irrepressible and says: “I’ve always had this sense that I could deal with whatever happened”. A popular and regular teacher at our Centre, Venerable Dekyi met the Dharma in 1992 and realised immediately that there was no other way for her to live. 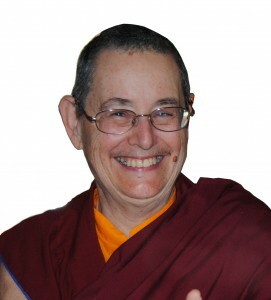 She was ordained a year later, has studied the Buddha Dharma in depth, taught at a number of FPMT centres, and has a broad understanding of secular life. Tsong Khapa’s famous Lam Rim says: “All teachings are to be taken as personal instructions”. The teachings have to inform all our thoughts words and actions – we need to turn the written Dharma into lived Dharma. This talk will look at the many ways in which this can be done. According to Buddhism, compassion is not pity but the sincere wish that all living beings be free of suffering and its causes. Research has shown that people who are mainly concerned with benefitting others are a lot happier than those who are self-centred. Learn more about this inconceivably beneficial mind-state. Renouncing these anxieties is the first step if we want to be happy. They destroy our peace of mind and lead to negative emotions such as anger, attachment, jealousy, laziness and guilt. Learn how to recognise when they have taken control and what to do about it. We have all felt guilty about things we have done that have hurt ourselves and others. These actions have created negative karma that will lead to future suffering. Feeling guilty is not a solution but purification meditations are. Any negative karma can be purified by sincerely undertaking purification practices. Venerable Dekyi will explain and help you do some of these practices. Mantras, meaning “mind protection”, are Sanskrit syllables that embody the qualities of the deity with which they are associated. They bring benefit to all who see, touch, hear or speak them. One important practice is that of Shakyamuni Buddha – the source of all Dharma. By engaging in the practice of Shakyamuni we can cultivate a connection with our Perfect Teacher and all sentient beings who have Buddha nature. We will also learn how to use mantras in daily life situations. Use the form available near the top of this page to Book and Pay for the workshops.